Behind My Red Door: The Simple Things in Life.. Sometimes when things don't go as you expect or want them too, it pays to step back and take stock of the good things in your life, especially the simple things that bring so much joy. 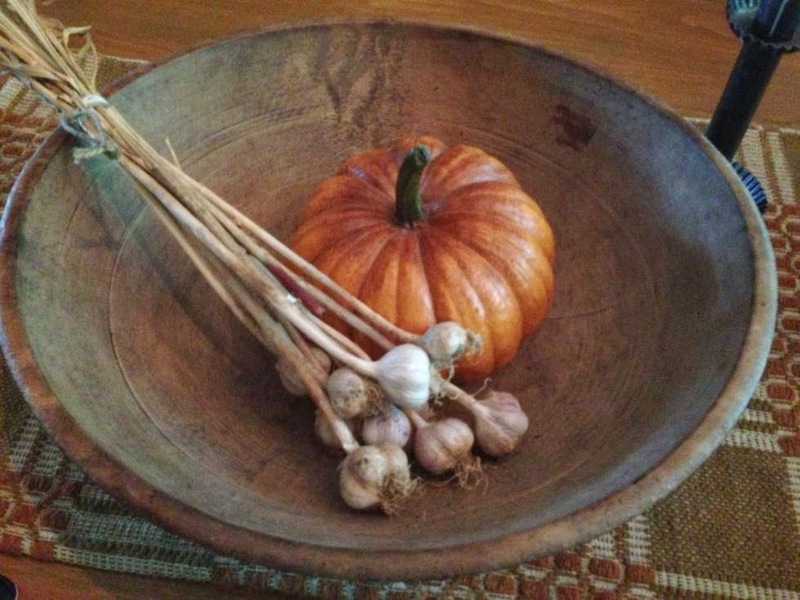 Julie, over at Country Girl at Heart posted about the simple things just when I needed that. Wednesday evening I had dinner out with my dear friend Jenn to celebrate her promotion and raise at work. We had a great time chatting and the chicken piccata was YUMMY! I ordered extra meals as take out to bring to my folks on the way home so my mom got a break from cooking. They were SO excited! And as an extra bonus, the weather was cool and it was just a really nice evening. Then David called me from Chicago between meetings. I could tell something was up and I finally made him tell me what was bothering him - he wanted to wait until he got home Thursday night. He told me about a change in his work schedule that will take place probably this winter, and will take him away from home way too often for both his and my liking. We are used to him working away from home - he has always done that but this new schedule will be the worst. He'll travel to the same corporate office every week for 4 days of the week, and it is 3/4 the way across the country. UGH! It's not that it is a change - we are used to changes in his schedule for 35 years - it's that he will be so far away - he can't get home in a few hours from where he will be, and because it we'll be apart so much. So I have to say, my mood changed on a dime. I was really upset but I didn't let on to him because I don't believe he should have to be far away from home and worry about me back at home. That's not fair to him. So instead, I had my own little pity party here that evening. I think we are all entitled to a little pity party once in awhile, but I make them REALLY short parties. Life is too short to dwell on the bad. Now, even though I am still not happy about it, I am determined to make the best of it. He has a great job, with great benefits and great compensation. We were blessed with a lot of security before, but this job kicked it up a few notches. Our plan is that we have the financial freedom so can retire in just a few years, on or before his 60th birthday, so if he can live with it, so can I. In this time when so many are struggling, we have MUCH to be thankful for. We have a strong marriage and this is nothing we can't handle. There are so many families facing far worse situations. We have since talked about me going with him occasionally (I could go anytime I want if I wanted to spend all day alone in a hotel room) and some other things to help make it easier on both of us, but being human, I was still a bit down Thursday morning. Then I read Julie's post and I thought, OK, that's what I need to focus on. The simple things - because they really do change the bigger picture if we can remember to focus on them. Thanks for posting that at just the right time Julie! A goodbye kiss from DH as he heads out the door, his "I love you sweetie" when he calls, and when he comes homes, hollering "Hi honey, I'm home" as he heads up the stairs. My blogging and Internet friends. Lately, you have honored with me so many kind awards and, more than that, graced with me with your humor, wisdom, kindness and companionship. 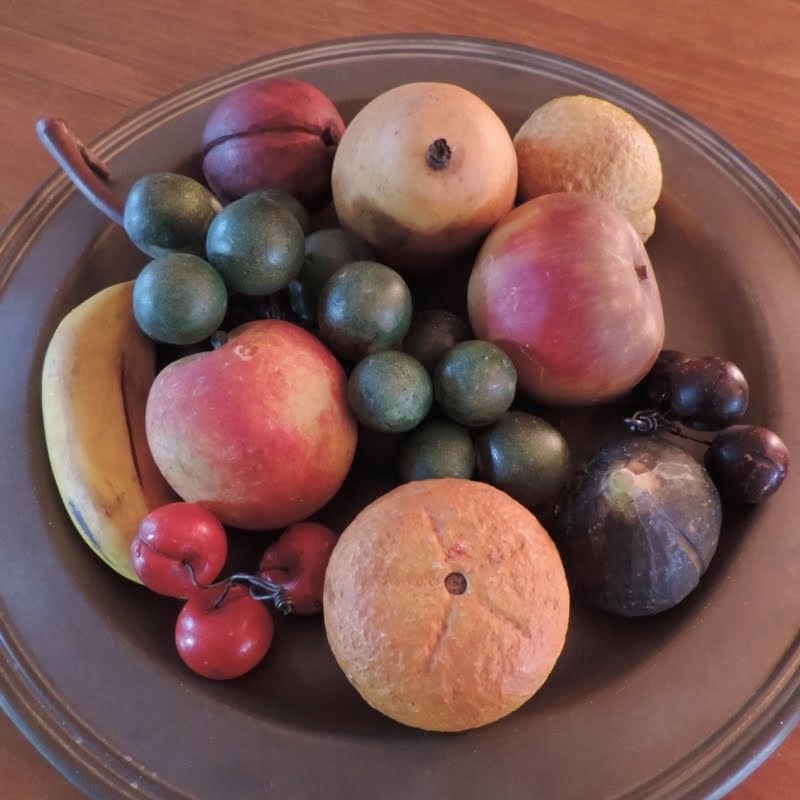 Since I first received the I LOVE YOUR BLOG award, I have been honored with it my five more sweet bloggers, The Pickled Pepper Patch, Cynthia Lee Designs, My Country Home, Back in the Day and Jojilla. Thank you ladies, it really means a lot to me that you think I am worthy of it. The feel of the hardwood floor under my feet when I get out of bed in the morning. I am not a carpet kind of gal. It's my barometer too. I can tell if it is dry or humid, cold or warm by my floor. The window in my bathroom. Already some poison ivy trailing up a tree behind the brook is turning brilliant colors. Soon the entire view from that window will be spectacular. Sometimes in the winter when I pull the shade up in the morning I'll glimpse a red fox trotting through the yard or spy a red cardinal in the pines. My own room!! My very own office/craft room where I can create and connect. With my favorite colors of black, tan and red, and my comfy daybed, my little TV, my samplers and gifts from friends, my stash of paper craft supplies, craft magazines, fabric, ribbons, buttons, threads and patterns, it is all good. My mom says all I need is a frig and toilet and I can move right in here. LOL I love it! A taste of something chocolate every day - isn't it wonderful knowing that dark chocolate in moderation is not going to harm us? The pretty flowers and herbs on the deck. I love to walk out to the kitchen grab my cup of coffee and open the back door and check out my plants every morning. I sometimes sit in the other rocking chair out there with my coffee. Yes, life is good. A phone call from one of our kiddo's - I really love that they still need mom sometimes! An email from a friend in another state. How lucky are we that even when those we love are far away, we have so many options to connect, thereby making it easier to maintain our relationships. See that's me in my blue robe. Right after my coffee, I head over here! 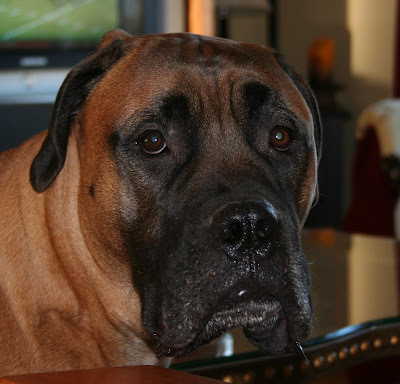 Looking forward to the next time we see our grand doggy Brady. He greets us like we are the most important people in the world. Well we are, aren't we? That bit of chill in the air - I don't need to explain any more, do I? The spicy aroma coming from the candle I am burning. Thank you Karen (PrimKarlee)! The sweet sounds from the CD I am playing. The songs are the ones we danced to at Jay's wedding reception in May. A good book to read. When my honey is on a business trip, I keep one on the kitchen table and read while I eat my dinner. I just finished one, and I have 6 new ones to pick from. I also read while I watch TV and eat breakfast and whenever I need to escape! The sound of the school bus coming and going in the neighborhood. It signals the start of a new school year and I always try to use that as a reason to start something new and fresh in my life. What will it be this fall? Maybe my punch needle? Maybe more? The black cherries waiting for me for later today. I hand picked the best from the bin the other day and divided them into bowls, one for each of a few days. This is the last of them and I will savor each one. 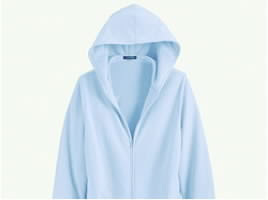 My light blue Lands End sweatshirt robe. It is like the sweatshirt material of old - 100% cotton and heavy! It has huge kangaroo pockets and a hood. They make a similar one now, but not like my old one. (nothing at Lands End is the same since Sears bought it- phooey!) Mine is so old it is getting threadbare along the edges of the cuff, and along the zipper. I have the newer version for when I feel I need to look good, but I'd rather wear the old one. It is like an old friend. I know this will sound like Andy Rooney - but I'll say it anyway. They don't make things like they used to. My blogging and Internet friends for reading this far! (yes you guys again) Thank you for always letting me indulge my thoughts and feelings; and likes and dislikes and you still keep coming back! 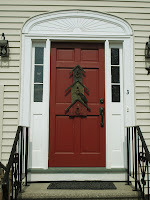 My red door - it's a cheerful greeting as I drive up the street, and it welcomes friends and family to our home. Yes, there are SO many simple things to be thankful for. Please share with us the simple things bring you joy! Let's start a domino effect and see how many folks can post about the simple things in the next few days.